Tickets for TGI Friday's NYC New Years Eve 2020 are currently not on sale. Times Square is home to one American favorite classic food chains, TGI Friday's. Located smack dab in the heart of New York City's urban mecca, this TGI Friday's location offers a welcome combination of urban excitement, family fun, and great food! 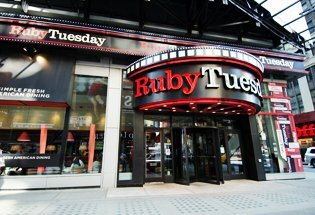 Known for its dependable classics, TGI Friday's is the perfect spot for New Yorkers to grab an after-work dinner with friends, relax with a happy hour cocktail, or for tourists to take in the best of Times Square. With comfortable, casual seating and a cozy ambiance, it is the optimal setting to unwind and catch up after a long day of hustle bustle. 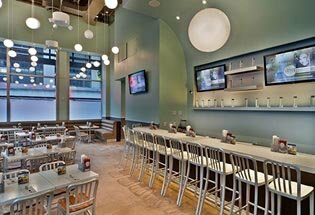 With a quintessentially American decor, the restaurant is decked out with a wooden bar, wooden tables and of course, high-def TV's. It's a great spot to catch the news, a game… and more. And at TGI Friday's, every day of the week is a Friday! If you're looking for a great, all-American classic New Year Eve this year, you are in luck because TGI Friday's is the perfect spot for you! Offering up everything you could want from a New Year's celebration, Friday's will leave you with nothing to be desired! With a ticket to this celebration, you'll delight in four hours of premium open bar starting at 9 PM. Start the last night of 2018 off right with a plethora of festive cocktails! From wines to beers and festive cocktails galore, you will NOT be at a loss for drinks. Trust us! Drink up… and eat up too! Throughout the night, you will enjoy a variety of classic American fare. Dance the night away with a live DJ spinning hits from yesterday, today and tomorrow! Don't leave those dancing shoes at home - you'll need them on this always-Friday dance floor. 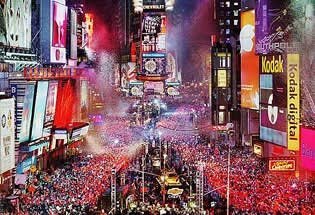 While you get your groove on inside, watch the famed Times Square ball drop just blocks away outside on Fridays' large-screen TV's. No need to brave the cold - stay inside and watch from the bar. It's the best of all worlds right here. So, what are you waiting for? Pick out a cute outfit, raise a glass, and get your ticket to TGI Friday's American New Year's Eve celebration now!